A Kawanishi H8K Type 2 Nishiki Daitei (Large Flying Boat) on Yellow Beach near King's Wharf is examined by men of the US Army's 165th Infantry Regiment, 27th Infantry Division. 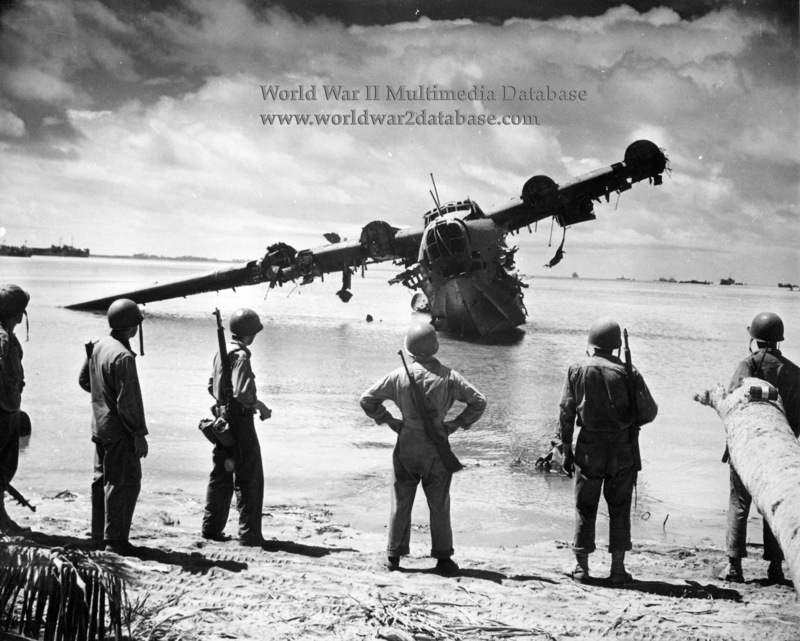 The seaplane, which landed during the raid, was disabled with a Boys anti-tank rifle by USMC Sergeants Howard E. “Buck” Stidham and Walter Carroll and others during the Marine Raiders attack on Makin on August 17-18, 1942. An air base on Makin was completed and ready to accommodate H8K reconnaissance and A6M2-N fighter seaplanes by July 1943. After a sustained bombing in September 1943, the surviving seaplanes were evacuated, leaving 100 of their ground crew behind. After the invasion on November 20, 1943, no major counterattacks were undertaken by the Japanese during the first night of the battle, nor was there any organized withdrawal eastward. Some successful attempts were made to bolster defenses along the eastern line and a few positions at the base of King's Wharf were reoccupied and new machine gun emplacements constructed facing the American lines. One machine gun was placed in the wrecked seaplane lying in the lagoon off of King's Wharf, another at the base of King's Wharf, and three more were set up in buildings in the area immediately southward. Snipers killed three men at the tank park. As they fired upon incoming landing craft, M3 Grant medium tanks returned fire with 75mm guns, silencing the machine gun in the wrecked H8K. The wreck of the H8K was still intact on Butaritari until 1980. It later collapsed into the lagoon but the wreck is still visible.